The Great Pyramid of Giza, which was built for an Egyptian Pharaoh some 4,500 years ago, has been called a wonder of the ancient world. Standing at 455 feet tall with a 756 feet wide base, it is the largest of Egypt’s three pyramids on the Giza Plateau. The base, it turns out, isn’t perfectly square — the west side is ever so slightly longer than the east side, making it just a little lopsided. 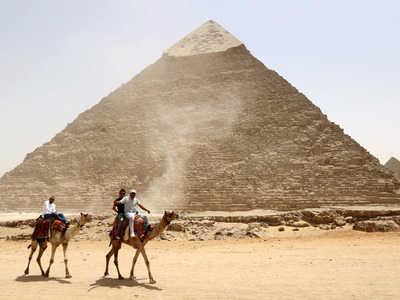 And this discovery might reveal some of the methods used by the ancient Egyptians to construct these awesome pyramids. They found that the west side was 5.55 inches longer than the east side, making the structure lean just a tiny bit to one side. The difference is so small that it went undetected for nearly five millennia, which is pretty impressive if you think about it. This means that builders probably laid the pyramid’s design on some sort of grid, and applied it to the ground during construction, ScienceAlert reports. “We hope to eventually figure out how the Egyptians laid out the pyramid with such precision and, in doing so, hope to learn much about the tools and technology they had at their disposal,” Dash said.